Safeguard your data against ransomware with instant threshold-based alerting on file server activity. Ensure fast response to other external attacks as well as insider threats by staying on top of suspicious behavior patterns and security violations across your Active Directory, file servers, SharePoint, SQL databases and more. Simply choose from a list of predefined alerts or use the flexible criteria to specify your own pattern of behavior that you consider risky. A user has just modified a hundred files within a minute — could that be ransomware in progress? Take action immediately to prevent the ransomware from spreading. There’s a spike in failed logons above your usual baseline? Determine the source IP right away and block it to stop the brute-force attack. There’s a change in a critical database no one is supposed to touch? Fix it before it leads to a data breach or a critical mistake based on erroneous data. A member of the design team has just accessed an Accounting folder? It’s time for a serious talk. An AD admin has just logged on to a production database? He’d better have a ticket for that. Gain pervasive visibility into the activity around your network devices, which is normally minimal, so you can spot any outliers and prevent malicious actors from taking control over your traffic. 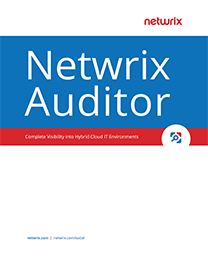 With the free Netwrix Auditor Add-on for Cisco, you can now minimize the risk of network sniffing and other nefarious attacks aimed at monitoring or manipulating the traffic to and from your network, or masking illegitimate access to your critical systems. Are there multiple failed logons from a single account? 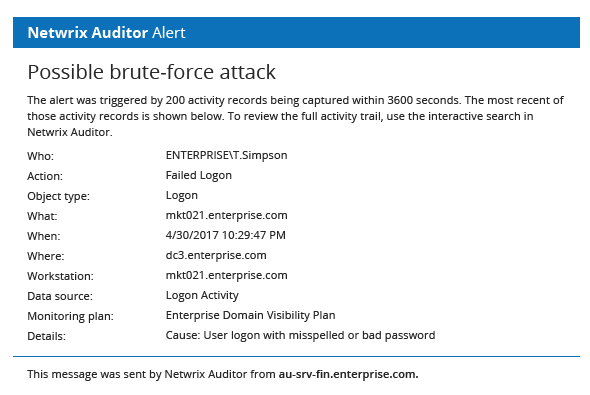 Check whether someone is trying to brute-force your administrative credentials on a network device. Has your admin logged on from an invalid IP address? Investigate whether that admin account has been compromised. 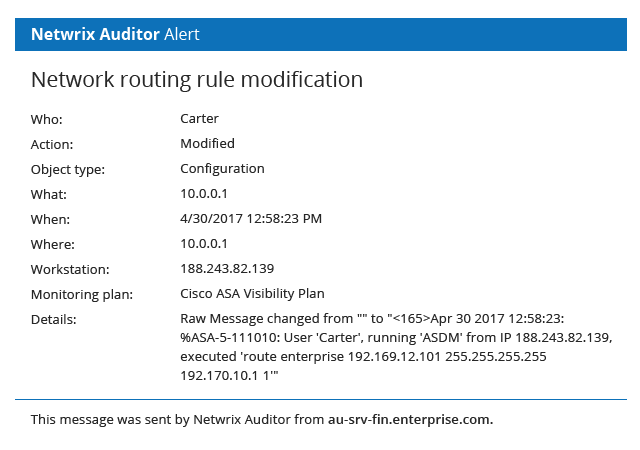 Has someone just changed a routing rule? Make sure the change does not put your data at risk. Establish and enforce segregation of duties and a least-privilege model, as recommended by industry best practices and required by many security regulations. Intuitive, fine-grained controls enable you to easily ensure that your various IT and business teams have exactly the right access to Netwrix Auditor’s security intelligence and settings. Relieve the burden of compliance and impress the auditors during your next check with out-of-the-box reports aligned with compliance controls. 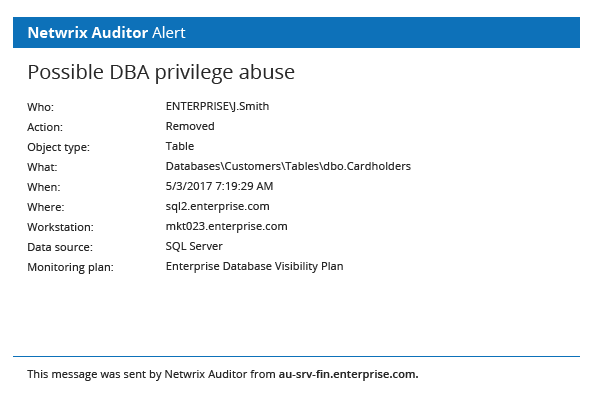 Netwrix Auditor now provides out-of-the-box compliance reports mapped to the specific requirements of GDPR, CJIS, FERPA, NERC CIP and GLBA, in addition to the common regulatory standards supported earlier. Learn more about 30+ enhancements that improve usability, performance and scalability. 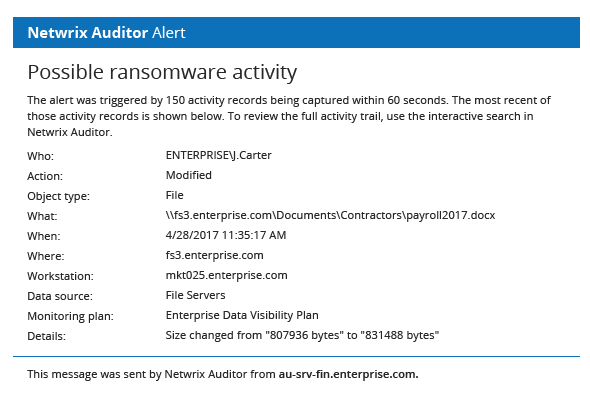 See the full list of Netwrix Auditor advantages and learn more about rapid detection and response to ransomware, aberrant insider behavior and other security threats. 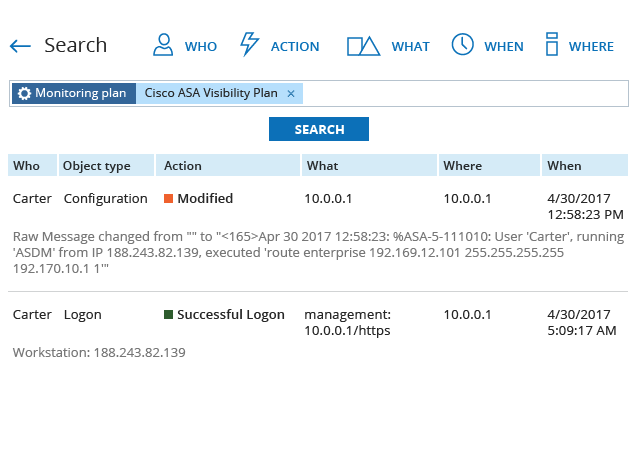 Visit our Netwrix Auditor Add-on Store to see how you can benefit from the RESTful API with examples of Amazon Web Services and HP ArcSight integration. 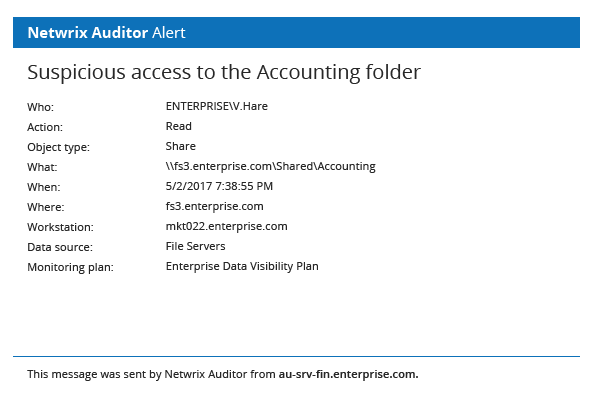 Netwrix Auditor collects audit data from any existing on-premises or cloud applications and stores in a secure central repository, ready for search and reporting. 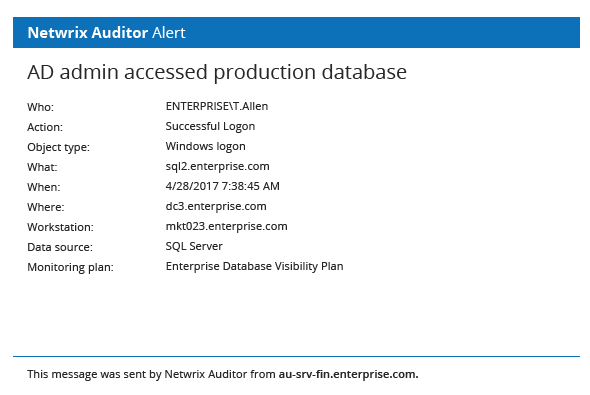 By feeding more granular audit data into your HP Arcsight, Splunk, IBM QRadar or other SIEM solution, Netwrix Auditor increases the signal-to-noise ratio and maximizes SIEM value. You can feed audit data from Netwrix Auditor into other critical IT processes, such as change management or service desk, thereby automating and improving their workflows.